I have been a Guild member for over five years now and, between you and me, I never regretted joining. Not only do I look forward to getting the magazine every quarter but I enjoy having access to the archives, to a zillion tested formulas, to the lively online forum, to the classes taught by the Guild, etc. BBGA describes itself on its website as “an independent and creative group of professional bakers, farmers, millers, suppliers, educators, students, home bakers, technical experts, and bakery owners and managers.” But to me, it is a big family centered around the craft of making bread and I really like it. And just so that you know, nobody is twisting my arm or promising me a free membership! Variable water absorption: you may need to add water until you get the right consistency. 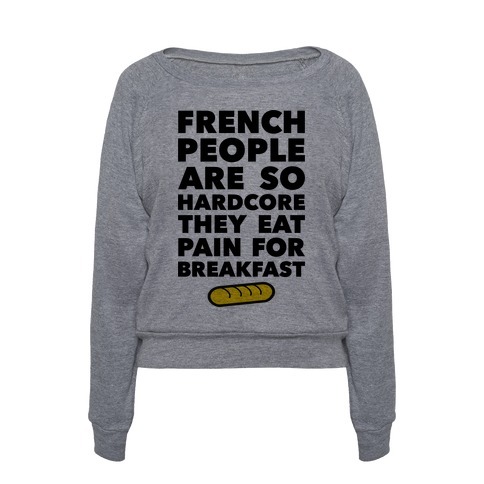 A francophone friend posted a pic of this shirt on her FB and I thought of you right away. Would definitely be a cute addition to your wardrobe 🙂 Have a wonderful week MC! Hello! I was wondering if I don’t have the teff and amaranth flour if I could use all bread flour with this formula? The ciabattas look really good. Love your site. Yes, of course, you can. But it won’t be an ancient grain ciabatta. 😉 And you may need to adjust the hydration (in other words reserve some of the water and add as needed). Thank you for your kind comment. Best of luck.